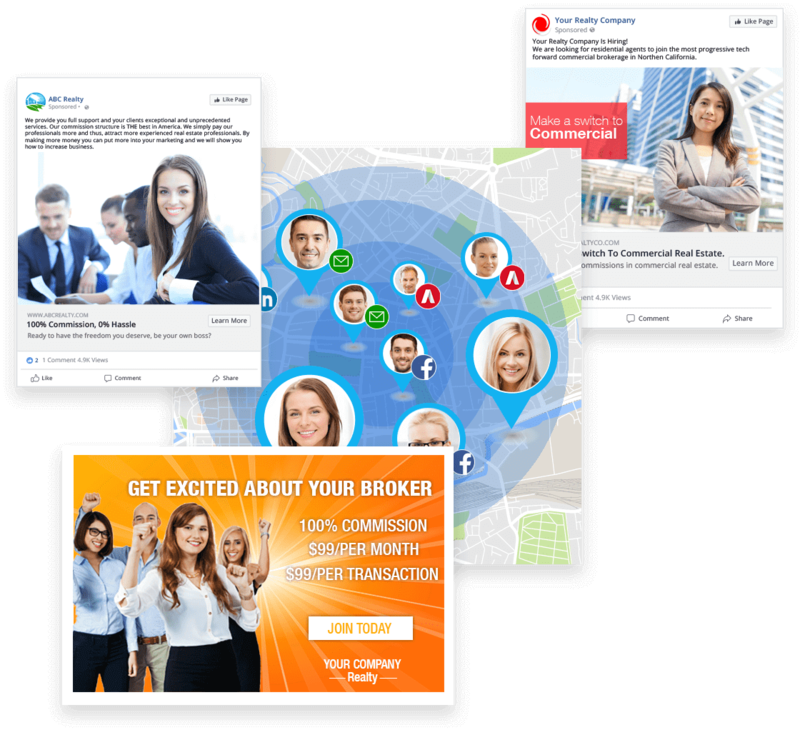 Real Estate Agent Recruiting Campaigns - Digital Advertising Campaigns for Real Estate Recruiting, Real Estate Agent Marketing, Mortgage Marketing, Loan Officer Marketing, Mortgage Leads, Real Estate Lead Generation, Real Estate Websites, Real Estate Social Media, Facebook Lead Generation, Real Estate Google Advertising, Pay Per Click Campaigns, Real Estate Landing Pages. Our 4 step process allows us to develop customized recruiting campaigns that attract high quality agents to your brokerage. Our fully managed programs have been developed to maximize your ability to target the right agents at the right time and generate a positive ROI for your brokerage. Understanding the details of what your brokerage is made up of. What makes you unique in the market place. How do you stand out from the competition. What type of characteristics are you looking for in the agents you hire. What are your goals and objectives. 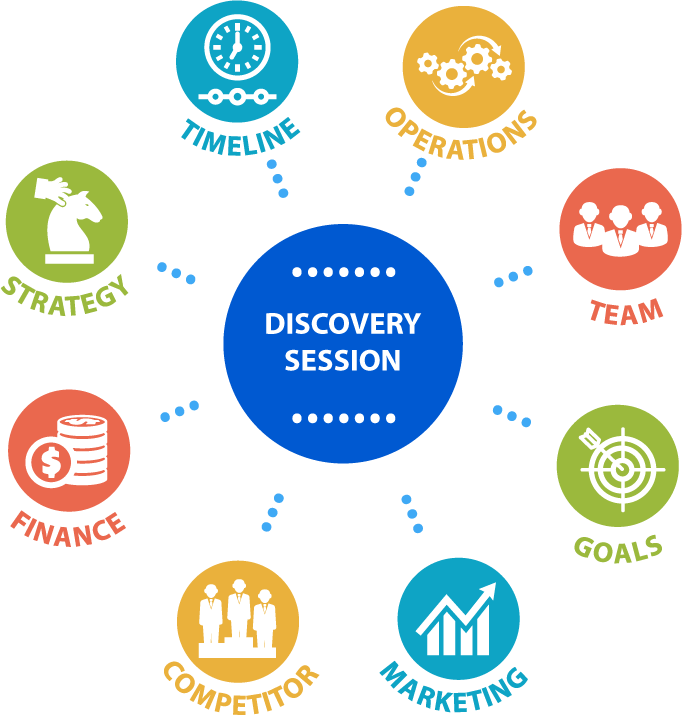 Based on the information collected during the discovery process we develop a marketing strategy to meet your goals and objectives. This usually includes a variety of distribution channels including advertisements on Facebook, Google retargeting, Linked-In, Twitter, and email. 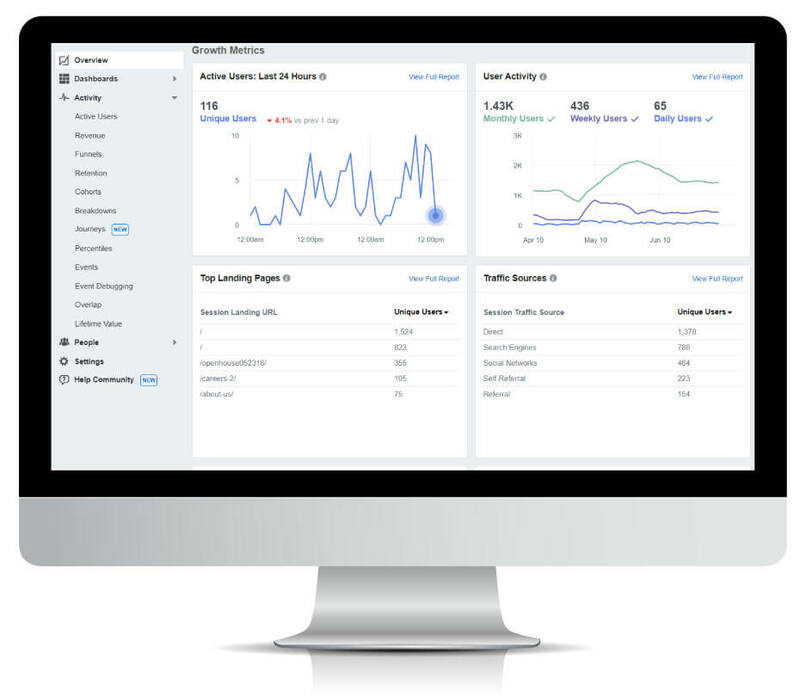 Once we launch your campaign we continually track all the essential key performance indicators on each platform to maximize your results and ensure that the design of the campaigns we have come up with are reaching your goals. Constantly monitoring the results of the campaigns and making changes and course corrections is standard practice for us. The right platform, at the right time with the right message to attract the quality real-estate agents you are looking for. Whether your brokerage is evolving to it's next stage of growth or just starting out, we work with you to clarify your purpose, find your voice, understand your needs, and help you reach your recruiting goals. During our discovery session we work with you to identify the strengths and weaknesses of your brokerage in the competitive landscape of the markets you serve, This allows our team to better understand your place in the market and gives us better insight so that we can target the best agents for your brokerage more effectively. 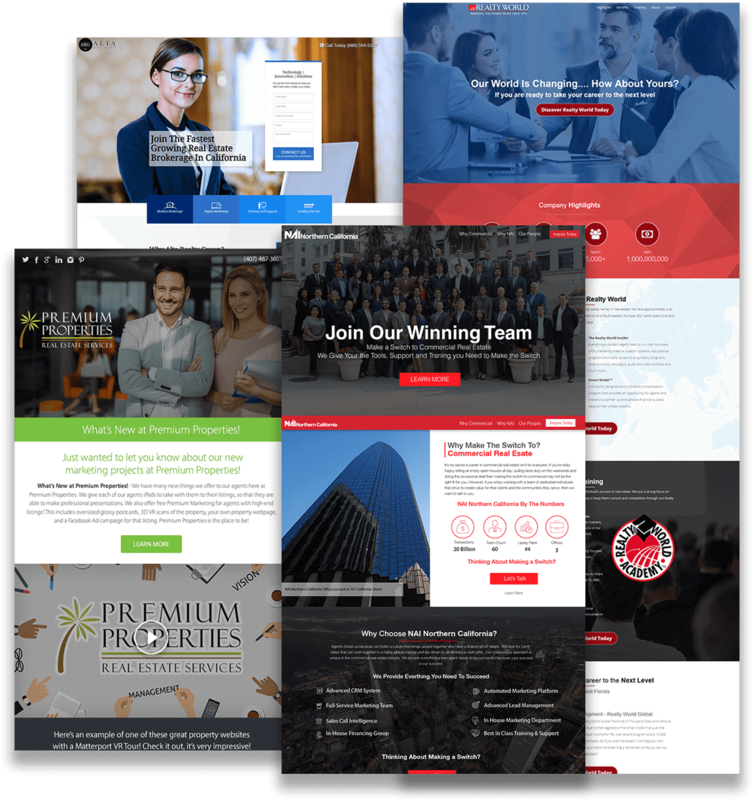 We hand craft beautifully designed email marketing campaigns, landing pages and social advertisements that are designed to convert and look great on every device. These designs show off your brokerage to make agents want to work for you. Your company culture, mission, office space, commission splits, benefits are all an important part of your value proposition and should be showcased in a way that makes prospects want to contact you. Whether it’s your company website, emails, or ads, we create beautifully designed marketing materials that engage real estate agents. When you partner with us we make sure your messaging and design resonates with your target market and drive conversions. Recruiting isn’t just a numbers game. Our targeting methods help us understand more about the agents you are looking for, giving us the insight needed to attract more quality candidates. We use our proprietary nationwide database of over 1 million licensed real estate agents, developed over the last 15 years to determine the optimized target marketing area or OTMA, improving your chances of attracting the best, most qualified agents in your target markets. This allows us to create sophisticated retargeting audience segments, and marketing funnels that show your recruiting ad's to the right agents at the right time. When it comes to your recruiting campaigns, we do not leave anything to chance. We continually monitor the key performance indicators (KPI)'s of each campaign on each platform and continually adjust to maximize performance. We help you recruit high-quality agents using sophisticated advertising campaigns designed to generate quality leads to help you grow and build your agent rosters. We have a track record of successfully recruiting real estate agents.